A recently discovered new species of toad, the Dixie Valley toad, was found by a team from the University of Nevada, Reno in a spring-fed marsh in the Great Basin of Nevada, which was once covered by large marshes and giant inland lakes during the Pleistocene Epoch and is now among the most arid regions in the United States with only one percent of the landscape containing water. Credit: Mike Wolterbeek, University of Nevada, Reno. Three new species of toads have been discovered living in Nevada's Great Basin in an expansive survey of the 190,000 square mile ancient lake bottom. Discoveries of new amphibians are extremely rare in the United States with only three new frog species discovered since 1985 - and toad species are even more rare, with the last species discovered north of Mexico, the now extinct Wyoming toad, in 1968. The Dixie Valley toad is in Churchill County about 100 miles east of Reno. The toad is only found in this isolated spring-fed marsh which make up less than four square miles, surrounded by an arid region where aquatic resources are both rare and widely scattered. Dixie Valley is the hottest and most geothermally active system in the Basin and Range Province. The habitat occupied by this newly described species is also adjacent to a proposed site for a geothermal power plant that could dry up the marsh and threaten the toad's survival. The small isolated toad populations also have the smallest individuals compared to other western toads. 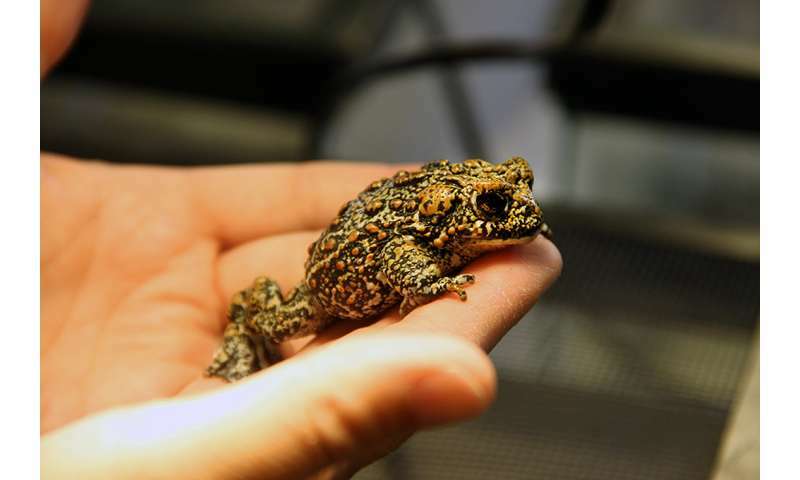 The Dixie Valley species has the smallest body size among the region's complex of related species in the western United States, and can be further diagnosed from other toads in the complex by the large glands on its hind legs in addition to its distinctive coloration. The discovery of the Dixie Valley toad was announced in the peer-reviewed science journal Zootaxa on July 6. A classic example of creating species to foil development. Their goal may be noble, but the end result is it undermines the entire ESA, because their opponents see through their threadbare efforts to create "new" species to in this case prevent a power plant from being built. The end result is what we are seeing today as Donald and his appt. Pruitt are doing their best to totally gut the EPA. As they do so they will render the protective element of the ESA mute as there will be too few enforcement personnel on the ground to enforce the laws already in place let along protect bogus "new" species. They had toads that looked just like that in Hiko Nevada around 30 years ago when I was there.